Continuing a months-long Apple Watch Series 3 rollout that began last year, Apple this week announced plans to deliver cellular-capable versions of the device to four additional countries in mid-June. 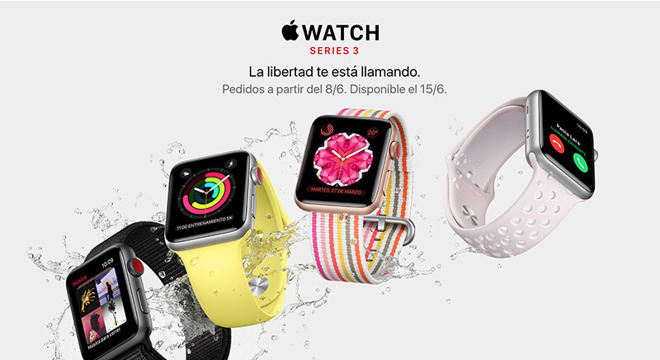 According to regional Apple websites, Apple Watch Series 3 + LTE models are going up for preorder in Brazil, Mexico, South Korea and the United Arab Emirates on Friday, June 8, ahead of wide availability on June 15. GPS-only versions of the device have been available for a few months, with the UAE included among a list of launch countries last September. Customers in Brazil will be able to pick up cellular Apple Watch Series 3 models for 3,119 Brazilian reais (about $840) for 38mm aluminum variants, while larger 42mm versions sell for 3,449 reais. Stainless steel models with Sport Bands come with a 1,600 real premium. All cellular models are supported by local provider Claro. Apple Watch users in Mexico will see support from AT&T and Telcel, with the device starting at 8,999 pesos ($441) for 38mm iterations and moving up to 14,999 pesos for 42mm stainless steel offerings. Pricing for South Korean customers starts at 529,000 won (about $495) and moves up to 829,000 won for 42mm stainless steel versions. SK Telecom and LG U+ are handling connectivity in that country. In the UAE, cellular provider Etisalat will offer initial support for Apple's latest Watch iteration, which starts at 1,679 dirhams (about $457) and goes up to 2,624 dirhams for the largest stainless steel model with Sport Band. Whether other telcos will gain access to the device is unknown, but a report from Gulf News suggests operators will need to make minor changes to their networks for full compatibility. Apple last expanded Apple Watch Series 3 availability last month when cellular variants of the wearable went up for sale in Denmark, India, Sweden and Taiwan. The company typically staggers cellular-capable product rollouts pending local regulatory approval, carrier support and other behind-the-scenes factors. Though Apple declines to provide specific Apple Watch sales numbers, the smartwatch is thought to be gaining marketshare as the popularity of basic fitness trackers flags. During Apple's most recent earnings conference call in May, CEO Tim Cook said the firm's wearables business, which includes Apple Watch, Beats headphones, and AirPods, grew nearly 50 percent year-over-year, with revenues equivalent to a Fortune 300 company. Earlier this week, estimates from IDC put Apple Watch at the top of the wearables market for the first quarter of 2018, ousting former No. 1 Xiaomi.